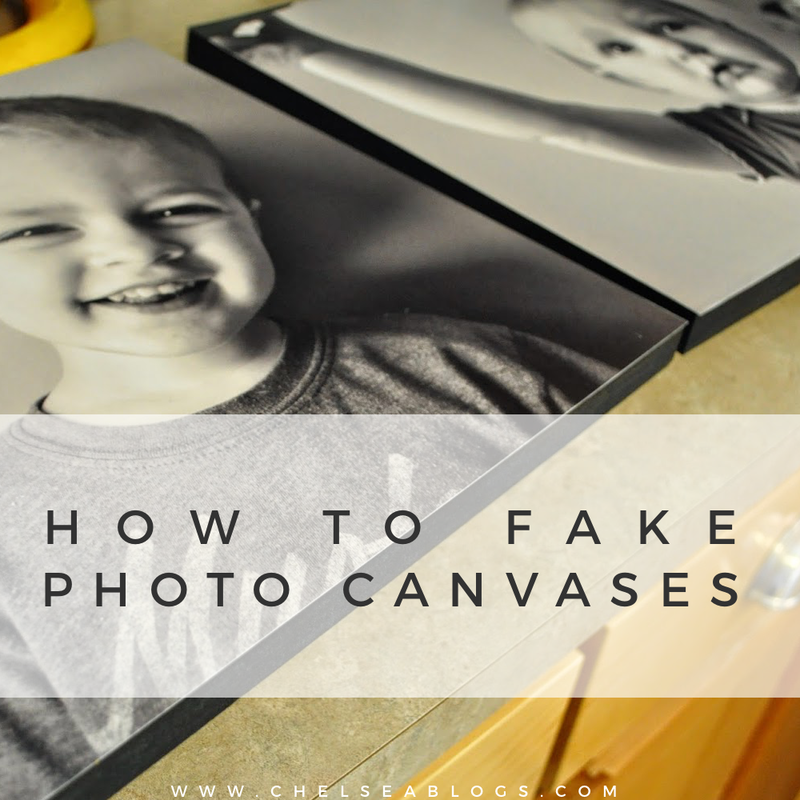 Chelsea Blogs: Faking photo canvases. I've been wanting some large photo canvases for the wall above our TV for, I don't know, ever. Practically since we moved in. It's been close to four years since buying this home, and the big wall behind our TV has set blank all this time. I had a really tough time justifying spending something like $30 a PIECE on the canvases I wanted…when I wanted at least 8 of them. My friend takes amazing pictures of our family, and it's always bummed me out that I've never been able to appropriately display them. So one day, I decided I was going to figure out how to fake a photo canvas once and for all. I rummaged around the garage and found some large pieces of leftover MDF from our laundry riser project. I believe it's 3/4" thick MDF, and I asked Tim to cut me 8 12x12" boards using this leftover wood. I knew I could get 12x12 prints at Costco for $2.99 a piece, and I really liked the idea of squares, so that's why I chose this size. I cropped my photos into square shapes in iPhoto and sent them off to be printed. Once I picked them up, I collected all my supplies: Mod Podge (not pictured here), black acrylic paint, some foam paint brushes and a whole lotta newspaper. This was a quick Saturday morning project and it really was so easy a caveman could do it. 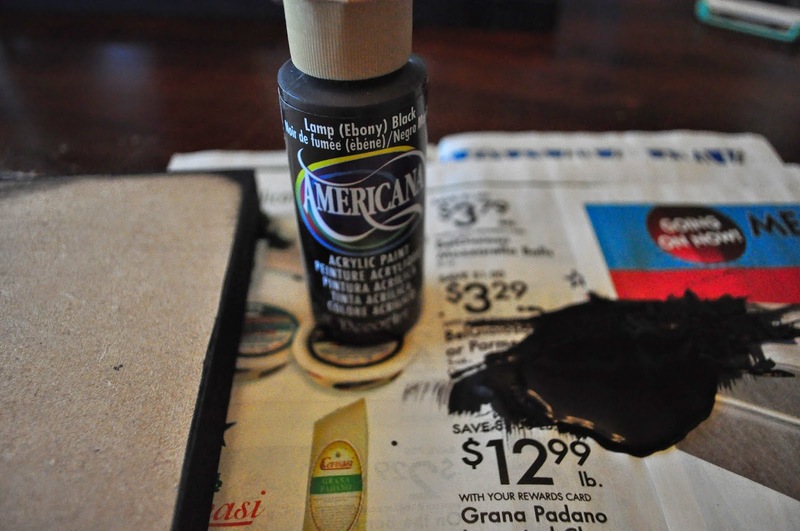 I chose this acrylic paint, which I have no allegiance to whatsoever, it's just what I could get from Hobby Lobby with my 40% off coupon, making it cheap (though I can't remember how cheap, probably in the neighborhood of $2 or $3 and I only ended up using like 1/4 to 1/2 the bottle). I painted all the edges of each board black to keep them from looking too much like wood boards (and also because my pictures are black and white). I also painted up onto the front of each board in case they didn't align perfectly with the pictures (they didn't, and I think it would be impossible to make them). Not a perfect science at all, obviously. Can be as messy as you want because this is all getting covered up. Then I Mod Podged all over the front of these boards so that I could adhere the pictures next. The pictures aren't going to line up perfectly, but you get the idea. You have a few seconds to push the picture around before the Mod Podge makes it impossible. Then I put a layer of Mod Podge on the front of each picture to finish it off. The Mod Podge got goopy on the side and I almost missed a few spots, so if you make these, make sure to smooth out the globs on every side. I put them all on plates/books/whatever I had lying around to dry for a few hours. And when they were done, they looked nice and pretty and mostly streak-free! My hubby put these "picture hangers" (he calls them; I don't know if they have a more proper name) on the back of each one. And then we used the toothpaste method to make hanging them SUPER easy (well, in comparison at least). And…voila! I am so much happier with the end result than I had pictured it in my head. 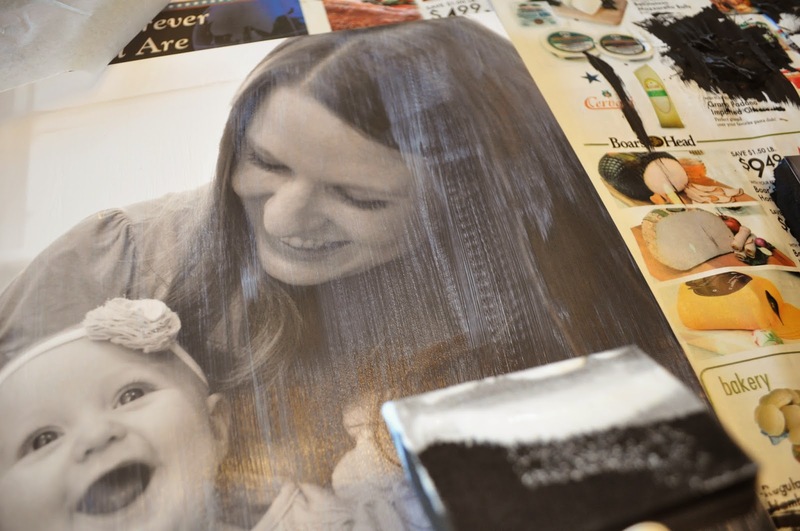 The TOTAL cost would be about $41 for 8 photo canvases, or $5 a piece! 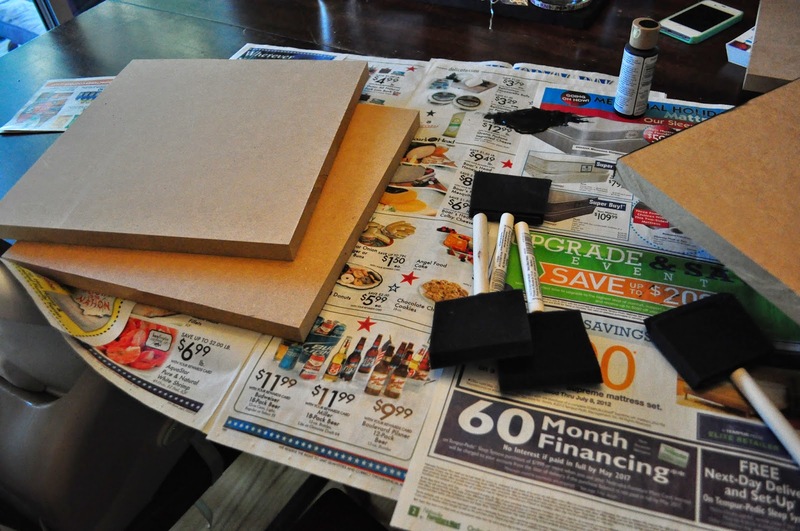 It cost me about $25 because I already had the boards, the foam brushes, the picture hangers and I used 40 or 50% off coupons for the paint and Mod Podge. When you consider that 12x12" canvases run a minimum of $25 a PIECE, that would be about $200 at the minimum for 8 of these canvases, for a savings of about $160! Love this project, and am now considering doing something similar in my home! If I do, I'll make sure to take pics for you! Please do, Adrianne! I would love to see them! Have to admit, I'm having a tough time figuring out how to get 12x12 prints. I even went to Costco's website, since that's the one you used, went to the photo dept, and now I'm lost! Help? Are you a member of Costco, Adrianne? If so, log in (or create a login), upload your photos, and then when you add them to your cart, you can go into your cart and you'll see all sorts of size options below each picture. 12x12 is one of them. So you'd change the standard 4x6 quantity to 0, and the 12x12 to one. Does that help? I'll look around and see if I can find 12x12's anywhere else. Thanks! I'm not a member of Costco, but I'm sure I'll figure it out! Thanks so much for your help. I am SO doing this project! this is AWESOME!! 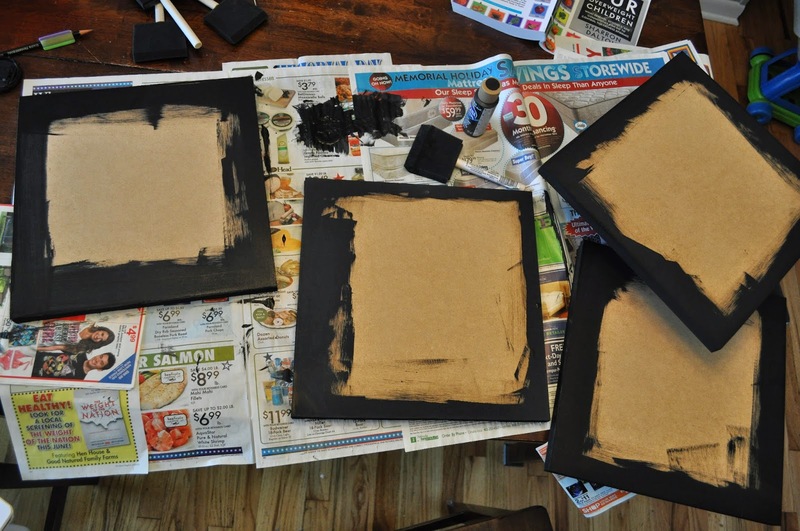 one idea to make it more "canvas like" would be to lay a 12X12 piece of canvas textured paper over each picture right after you've applied the modge podge. 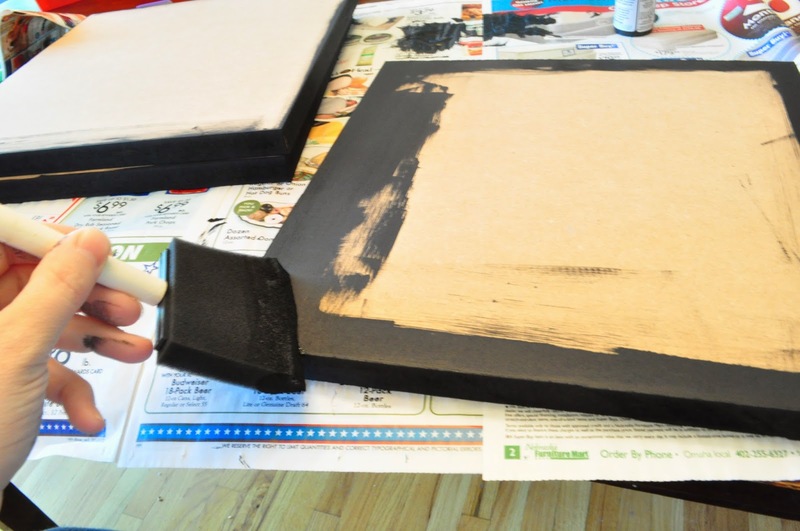 remove it carefully but quickly and you should have the "feel" of canvas without the cost. What a GREAT idea! I'm definitely trying this when I make our next "canvases" for the kids' rooms. Thanks! Thanks! Definitely worth looking into. Did you purchase one big sheet and then cut the boards? OR did you purchase them that size? If so where did you buy them? We purchased one big sheet and my husband cut the boards. I've always been told Home Depot will cut wood for you, however (maybe Lowes, too?). This project sounds awesome! Thank you for the cost break down also! I cannot wait to move (sometime in the near future) when I will actually have wall space and not a whole lot of windows and another things blocking pretty picture hanging space. :D This would also be a wonderful idea to make for the grandparents. How clever... LOVE this idea and will be making some myveryownself... Thanks for the tips! Loved this idea so much, I made a few for my mother for Christmas! 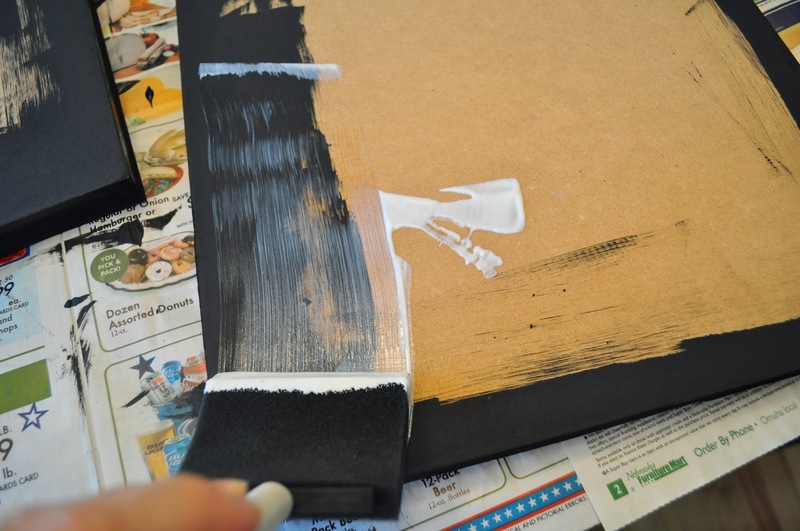 Cut paper the size of the back of canvas WITH the hanger on it, and punch a hole through the paper where the hanger is and use that hole to mark your wall. I like to do groupings of different sizes and with some blue painters tape, you can "fake" hang the picture/paper first and play with the placements! Just love ur idea...could you please tell what mdf is and where can I purchase it. If at Home Depot..is it in the wood section?? Great idea, for those that don't want to cut their own boards, most home supply centers will cut the boards for you for a small feel. HTH. I noticed you had not yet received a reply so thought I could help out. 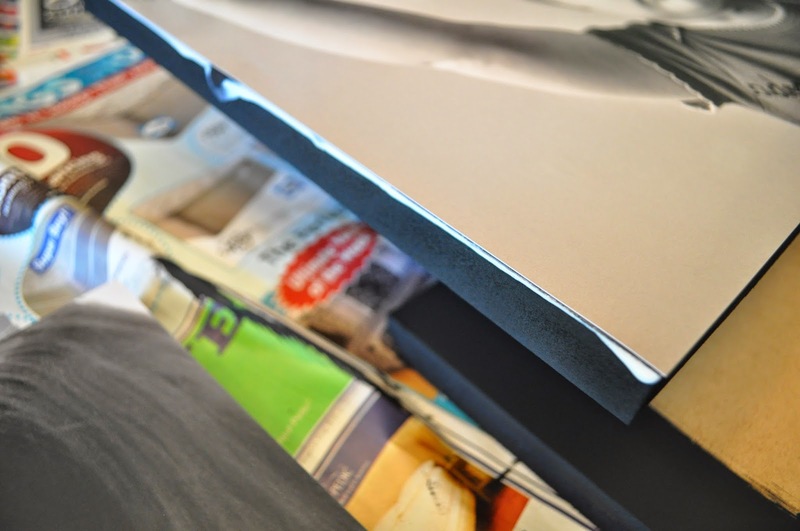 MDF is Medium Density Fiberboard, which is basically sawdust and glue. Home Depot and Lowe's both carry it near the plywood sheets. They usually have quarter sheets which are 2 foot by 4 foot an aisle or two from the big 4x8 sheets. And yes both places can cut it for you but depending on who is doing the cutting, the results may or may not be totally correct. hey where did u get the boards though? Your 'canvases' look fantastic! I'm definitely going to give this a try - thanks! Medium density fiberboard = MDF. Yes it would be in the wood section. I am so excited to see this project! I've never even owned Modge Podge (I know, I know) but I am for sure doing this! Yes, we had our original boards cut for a different project and the MDF we used was leftover for this, or we would have just had Home Depot cut the squares into 12x12". Although I have heard the cuts aren't always exact, so I'm not sure about that issue. We got our original boards at Home Depot. I use persnickity prints for my 12 x 12 prints....very happy.....love the project! This is such a great idea! The only concern I have is fading over time, any thoughts on ways to prevent that? Great idea. One question: did u have pictures printed with matte; semi gloss; or glossy finish? These look fantastic! Can't wait to try these and save some $'s. Thanks for sharing. I'm wondering why you have to put the Mod Podge over the pictures at the very end? For a glossy finish? Hi! 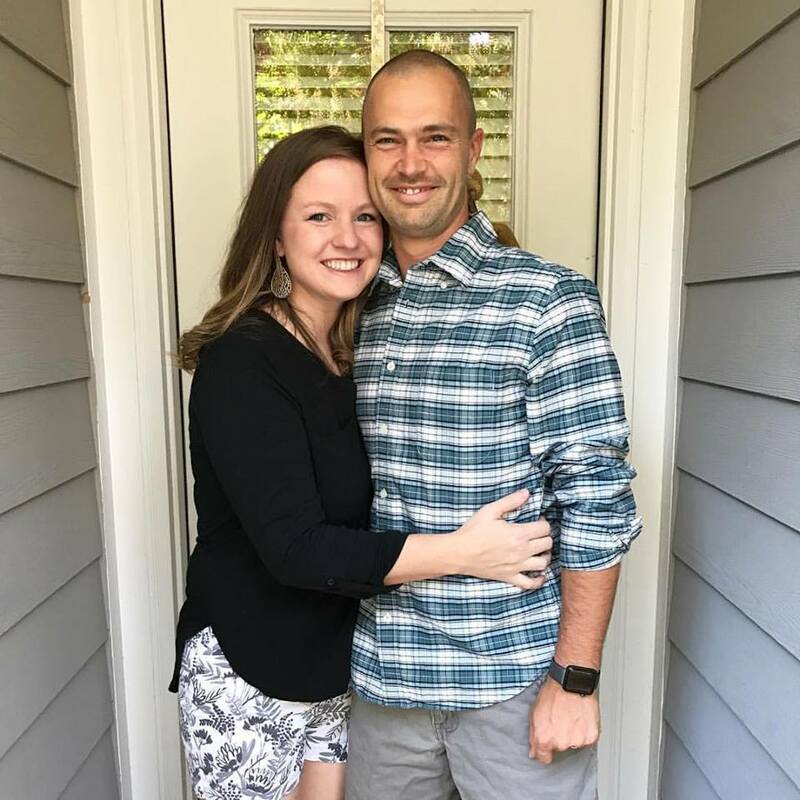 I'm going to do this project for Mother's Day, but I was wondering what resolution the photos should be at so that they aren't pixelated at 12x12. I've got some professional photos, but even those aren't at a high enough resolution to be blown up that big. Do you think someone can help me out with this? Hm, not sure technically, but I used pictures that came off my camera and pictures that came from my photographer and both were totally fine. Not for the finish as much as for more protection to ensure the picture sticks and durability of the pictures. The prevent fading, peeling corners, etc. This is awesome. I used this to do pictures from my daughters wedding and gave them to them for their first Christmas. They turned out great HOWEVER I cannot remember which Mod Podge I used... They have so many options. Thanks for sharing!!! Hi! Love this idea! You know what I was thinking? If you were to wrap the photos over the edges on all sides it would look more like it was a real canvas stretched over a frame! I'll have to test this theory! ;) Love the layout of your photos. Beautiful! Great idea! I tried something a little more costly, but great effect: bought mounted canvas frames at Hobby Lobby, and Mod Podged a large photo to it. It has been exposed to the weather (on a screened porch) for 2 years, and still looks great. Hi Dawn! Nope, I just did one coat and I've had zero lifting or yellowing. I am doing the same thing as Melissa. 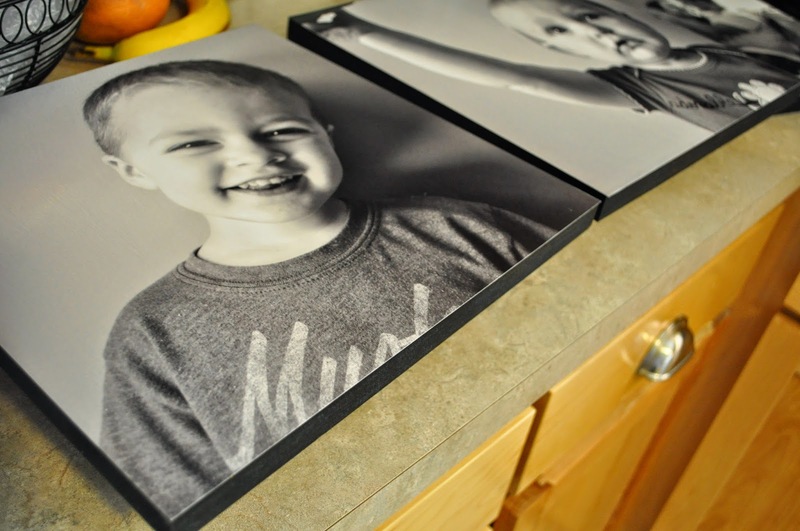 I bought a 2-pack of 12x12 canvases at Michaels for 3.49 (on sale 1/2 off) and Office Max does 12x12 reprints for $4.79! I hope mine turn out as good as yours!! 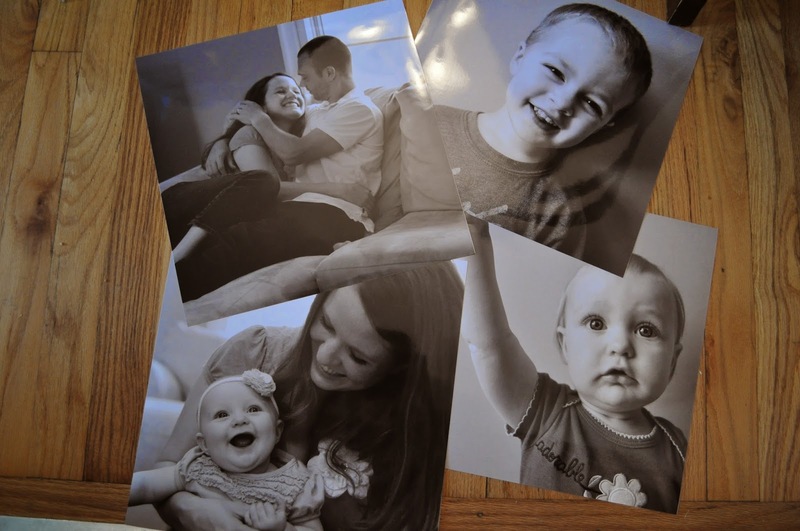 Just ran across this idea on Pinterest, but you can get 18"x24" posters for $2.97 at shortrunposters DOT com - will get you 2 12"x12" photos per sheet, making them $1.49 each (or 8 for $11.88). Great tutorial and love your finished project! Good idea! I´ll do the same with my watercolors! 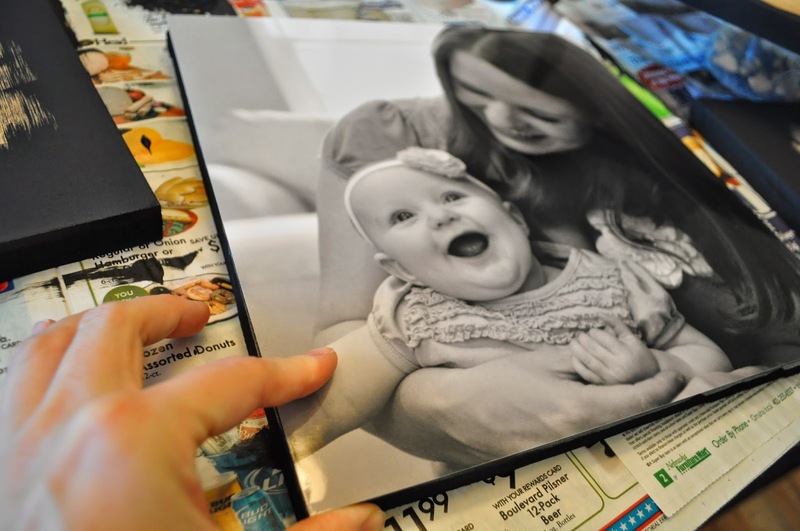 wWas your photos printed on normal photopaper or must it be thicker? Hi everyone! I'm going to try this too! Not sure whether to try the mdf or the canvas. I recently tried to make a collage with scrap booking paper on canvas using mod podge but it wrinkled - I did use some white craft glue under the paper because the mod podge wasn't holding the paper in place as I worked, and not being a very crafty person an not having researched "how to" I didn't know if it would hold or not... Anyway... I have wrinkles paper :( any tips? I'm afraid if I try with a photo it will wrinkle too. LOve this post! I have lots of photos from a trip and have been wanting to put them up. Can't wait to try it. I loved the idea! Found you via pinterest. I am definitely going try this. I am planning to paint a family tree on our living room wall and would be neater to use 'canvas' prints instead of regular frames. I am planning on using command strips for hanging them. Hope they turn out as good as yours. When you did this did you just have the pictures printed on regular photo paper? Yep, regular old photo paper! Persnickety Prints and Scrapping Simply also offer 12x12. They are both $5 for shipping and $1.99 for prints when they aren't on sale. 'Not worthy, oh mighty Goddess of Home Style Photo Canvas! ( I shall not say "fake" the finished product made in your Home is as, if not better, due to all the personal touches. I have 10 Photographs I took but when I looked into the Price, I decided I didn't want to spend a large portion of my 'Food Budget' on the very pricey non Home Style Photo Canvases. So I shall spend , what to me seems to be, a very reasonable amount to do something I couldn't even afford to have done. (unless a Lottery Win happened! ( and we don't buy Lotto tickets). So ' HUGE THANKS CHELSEA ' and to her very helpful Husband. This begins on Friday and I am so ready. Really, Thanks for sharing your amazing idea. Wow!! This is fantastic.. I have some super cute pictures that I spent 200.00 to have taken but haven't given them out cause all Igot was a cd and I wanted to do something Great with them.. Looks Like Perfect Idea for Fabulous Christmas gifts.. THANKS SOOO MUCH!! I have a question I just tired this project and after I put the picture on and went to mod podge it the picture bubbled up what am I doing wrong? Hm, I'm honestly not sure! I can't think of how this would happen if it's printed on normal photo paper? I'm so sorry! When you say you had your photos printed, did you send them in to WalMart or WalGreens and had then photo printed? The ModPodge didn't bubble or react with the finish on the photos? This is a great idea!!!! This is a great idea. 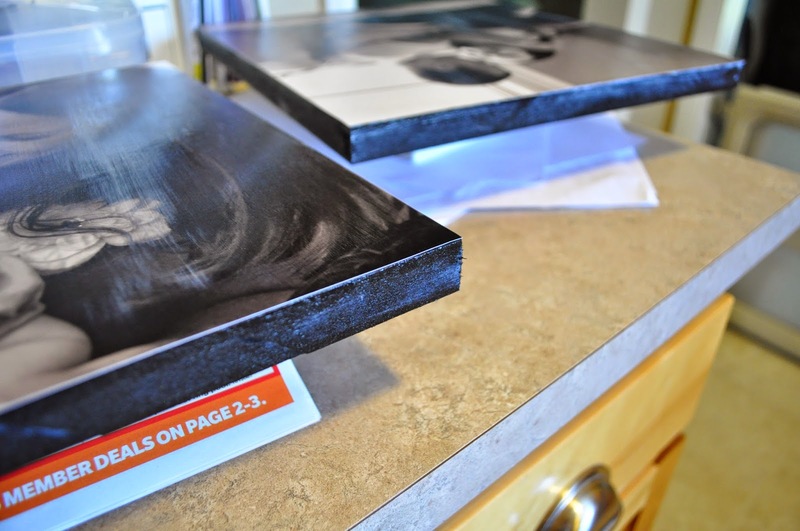 You can purchase artists' canvas boards, pre-mounted, at Big Lots for around $5.00 each. All you have to do is paint the edges and do the decoupage. The canvas is already stretched on a frame, and is easy to hang with no extra hardware. I paint (amateur), and the canvases I have gotten from Big Lots have all been suitable for any art. They have different sizes, but all the prices are really low. Maybe not enough mod podge? 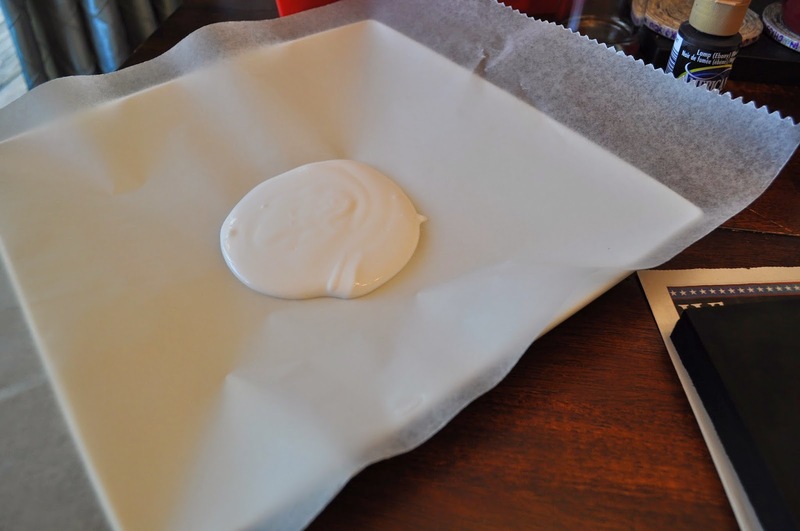 I remember working with this stuff in grade school and it was a bit tricky because if you put too thin of a layer, parts would dry and create bubbles. Great idea and wondering what your wall color is...it's fabuloso! I can see why! Thank you for providing the color! Fab idea! Love how it turned out! Hi I have a question!! So I came across this in Pinterest and decided to try it. Just finished mine and I am in LOVE! This works so great and my family was shocked at just how good they looked! You are a genius! Thanks! So glad you love yours! Aw, thanks for the sweet words! Yep, sent them to Costco. No bubbling or reacting. Thanks! Does it matter what type of modge podge you use?! deffinetly want to try these for my bedroom!! too excited these look fantastic! I use ScrappingSimply.com. 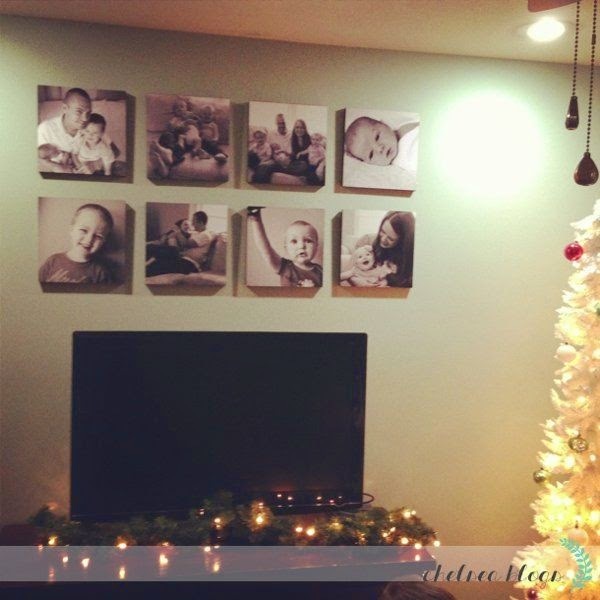 $1.99 for each 12x12 and they are AWESOME quality!!! This is a great idea... and page prints can also be ordered from Creative Memories digital centre for about $4 each and they will be delivered to your door! So amazing. I can't wait to try this! Found this wonderful idea on Pinterest and can't wait to do it. Thanks so much. If you are going to use slick prints from a photo shop.... you might want to just use Spray Mount to attach the photos to the boards. Is what I use when doing displays (Graphic Artist). For photos to not look pixelated get them at the highest resolution you can, 300 DPI or better for the best result. I'm a photographer but never could warrant the expense to get my photos done up in canvas. I am definitely going to try this. I hate cutting matt boards and working with frames because I usually break the glass. Yes I am a clutz also. lol I have a big empty wall in my hallway that is the perfect spot to try this out. Thanks so much Chelsea. A little question I went to walmart today to buy the mod Podge .... but I found like 3 different kinds I remeber they looked alike but one was matte and the other one was glossy..... can u pretty please tell me what kind of mod podge I have to get???? bt since m nt able to find thick mdf board...cn u hlp me vd a substitute? I am so interested in making this! I am looking at the Mod Podge and there are a lot of different kinds! Which kind do you use? You can make the image look like it is on canvas by selecting Normal, Light, or Strong Texture and selecting Oil Painting. I can't wait to start on this! We have a huge wall behind our TV that is occupied presently by a too-small quilted wall hanging I made. I can't wait to move it elsewhere and get started. It's killing me just waiting for the photo's to arrive! Hi, I have tried this before but got wrinkles under the photo. 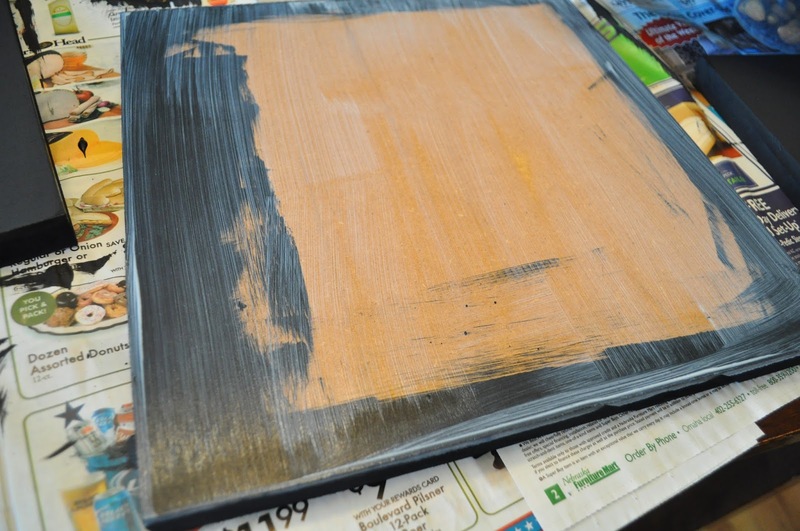 As well, The top coats streaked when using the Modge Podge to seal pics. Any solutions. I love your blog. This is a great Father's Day gift idea. I have some photos I have been wanting to do for my husband & just didn't have the money to put out at $30 plus a pop. Thank you for sharing. Thank you for everyone else adding info as they have tried to do the project and made enhancements. I am definitely going to use this for some old family photographs in black and white. Why do you put the Mod Poge on the face of the picture? Ok something that troubles me is adding the picture hanger to the board! Please help me! Oh btw I love these!!!! It would be helpful if everyone would read the previous questions & replies before asking a question that has already been answered. Just sayin'. Love this idea!! I'm thinking of using a pic I took, then separate into 4 12x12's. Thank you! My boyfriend is letting me decorate his living room and LOVES old wartime photos. I found a few LIFE magazines at an antique shop and planned on just laying them out on the coffee table- BUT THIS! I'm just concerned about the modge podge on the magazine cover material....? Is it me or are all the pictures "not there"...can't see them. This is an idea, and it would be pointless to get hung up on 12 x12. Any size print would work with this and I have in the past used it for 6 x4 and 4 x4 standard prints. My blocks were cut and painted back and sides, by a cabinet maker/joiner. Had 300 done and this makes them cheap. With whatever print size you choose, have the blocks cut 1/8th to 1/4 smaller than the print. this makes the fit easier, as there will be on overhang that can be trimmed after the glue is dry. turn it upside down, zoom round with a craft knife. Further to my previous comment; DIY, or professionally produced, a hole drilled in the back will save on hardware costs (hook devices) A hole will have the block sit flat to the wall, and if two holes a drilled in the back of a rectangle block like 6 x4, it can be hung profile or horizontal. Wife + mama of 4. Aspiring writer. City dweller with beach daydreams. Saved by grace.